Traffic simulators were once a widespread tool used in Driver Education. Many programs have dropped this phase of the program because of costs for upkeep and space to house this part of the program. But we are convinced, now more than ever, that an important part and function in the learning process is developing the mental part of the driving task in a more controlled fashion. And although technology has changed with the passage of time, and more interactivity is catching the eye of our young new drivers, we have found that the lessons learned in our simulator lab are invaluable. 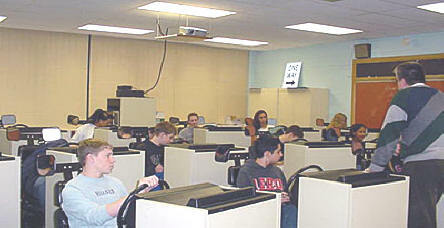 So we continue to offer lessons in our simulator lab phase of the program. These tools assist in the development of procedural responses and most importantly the perceptual skills needed for collision free driving . The concept of what driving is and what needs to be addressed has also undergone changes. The concept has stretched from that of learning how to drive as strictly as a manipulative motor skill, to the emerging concept that driving is a mental and social task; recognizing that so much more goes into making a driver safe and collision free. The many topics associated with driving needs to be taught and blended with the physical requirements. Thus learning has to be partnered with parents to provide various exposures that can't possibly be experienced in a semester or summer program. Our simulator experiences help to standardize many of the required experiences of our curriculum ie; night driving, weather conditions, super freeways special conditions or city driving. Some programs are challenged to present necessary skills in these conditions and environments, but our simulation program fills these needs and behind the wheel voids. This also compliments our classroom information. The main objective of our simulation lab is to provide a foundation of specific procedural and mental skills which should facilitate learning and transfer to the on-street behind the wheel experiences. Observation time in car is aided by the lessons in the simulator lab, as the strategies can be taught in the safety of the simulator and can then be applied ito real behind the wheel traffic. We try and make all simulation lessons closely complement our in car efforts. The best replication of parts of the driving task in the simulator are those involving the human functions of perception, judgment and decision-making, ie. where to look, when to look, how often to look. The varied and constantly changing traffic scenes presented in motion picture format allow all students to see how situations develop and give each student an opportunity to take part in responding in a driving like way to what they see. It is a way for all students to experience the same situations no matter what the time of day, what type of weather or how dense or light traffic exists during each group of students instruction time. This information helps support the curriculum that NY state lays out to be accomplished in this course both in classroom and in the Driver Education car.